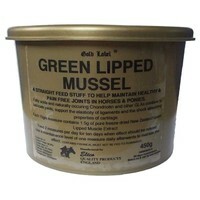 Gold Label Green Lipped Mussel is a complementary feed stuff to help maintain healthy and pain free joints in horses and ponies. Green Lipped Mussel is a natural source of Omega-3 fatty acids and chondroitin, which have anti-inflammatory and joint lubricating properties. It also supports the elasticity of ligaments and the shock absorbing properties of cartilage. Each 15gm measure contains 1.5g of pure freeze-dried New Zealand Green Lipped Muscle Extract in a carrot powder base. Feed 2 measures per day for 10 days when effect should be noticed. Use a maintenance level of 1 measure daily afterwards to maintain the effect.